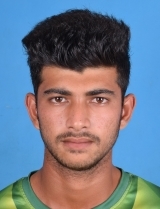 Nayeem Hasan (born 12-Feb-2000; Chittagong) is a right-handed batsman and right-arm offbreak bowler, who plays international cricket for Bangladesh. On Nov. 17, 2018, he earns maiden Test call-up for West Indies series 2018. He made his international debut in Test match against West Indies at Zahur Ahmed Chowdhury Stadium, Chittagong on Nov. 22, 2018 and he picked up five wickets in his very first innings.